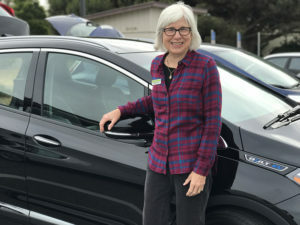 Join us for National Drive Electric Day – Monterey Bay, coordinated in conjunction with National Drive Electric Week, a nationwide celebration to heighten awareness of today’s widespread availability of plug-in electric vehicles and highlight the benefits of driving electric. MBEVA in partnership with Ecology Action and the Electric Auto Association Central Coast Chapter will be hosting National Drive Electric Day – Monterey Bay on Saturday, September 8th from 1-4pm. The event will take place in downtown Santa Cruz on Cooper Street next to Abbott Square. We will have a large electric vehicle (EV) display area including a number of the most popular EVs on the market today. You’ll have a chance to talk with EV owners, experts and local dealers about their experiences with going electric. Ecology Action will also be hosting electric vehicle test drives and electric bike test rides! 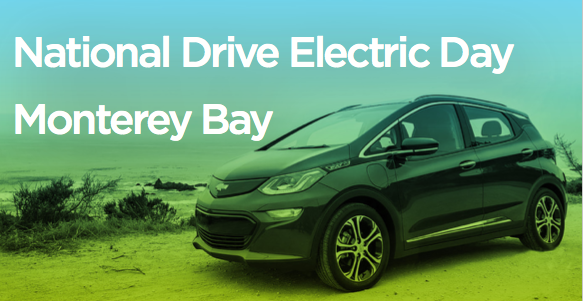 With over 180 Drive Electric Events taking place across the Country, you won’t want to miss our premiere Monterey Bay Area event! 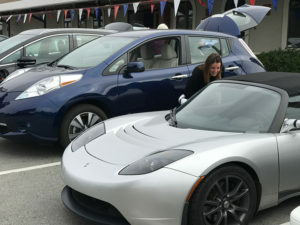 Check out the national organizers website for National Drive Electric Week to see details on events across the country. 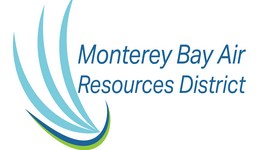 For questions about our Monterey Bay event please contact Emily Gomez at (831) 515-1328 or egomez(at)ecoact.org. Electric vehicle display where you will have the chance to take a look at all types of EV models and talk with local dealers and EV owners about their experiences. Test Drive area: Take a drive or two or three, talk with local experts and dealers, and compare between models. Test drive vehicles include the Tesla Model 3, 2018 Nissan Leaf, Chevy Bolt and Chevy Volt. Talk with local solar companies about how to install home charging units and connect new or existing solar panels. According to the EPA, motor vehicles are responsible for nearly half of the toxic air pollutant emissions in the U.S. and account for 75% of carbon monoxide emissions. In Santa Cruz County, 47% of greenhouse gases are contributed by transportation. Plug-in electric vehicles (PEVs), which require no gasoline and have no tailpipe emissions, provide one critical way to significantly decrease air pollution thereby helping us address one of the most pressing environmental issues of our time: climate change. EVs also help to reduce our dependence on oil, create American jobs, and improve national security. For more information visit our Why Drive Clean page. 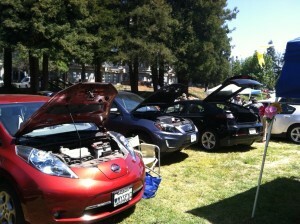 Plug-In to the future with us at National Drive Electric Day – Monterey Bay!